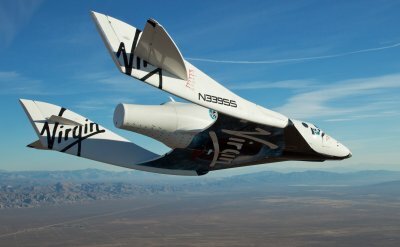 Scaled Composites carried out a third glide test flight of SpaceShipTwo (SS2) on Wednesday. According to the company’s WK2/SS2 flight test logs, SS2 flew free for 11 minutes and 39 seconds after its release from WhiteKnightTwo. There were no major milestones reported for the test, and all test objectives were achieved, according to the log. Those objectives included flying to “a more aggressive stall indication” and a slightly higher airspeed and g-forces. Where can we find announcements of upcoming flights? I live within driving distance of Mojave spaceport, and would like to go out and see the first powered flight, definitely the first space flight, possibly a glide flight as well. Is there a e-mailing list? F.E. Harris: routine test flights are not announced in advance, unfortunately. Even the first glide flight in October was not announced in advance by Scaled or Virgin, although Popular Mechanics did find out about it a day in advance. Major milestones (including down the road, most likely, the first flight into space) are publicized in advance by Virgin in particular, although not necessarily open to the public. I was hoping they would be willing to do a non-binding e-mail list for a few of us local enthusiasts, but I can see how that could snowball, once the press got onto it. Well, at least I can look forward to announcements of some major milestone flights, some time next year. This story quotes Will Whitehorn, president of VG. “There will be very short firings of the motor, and then we’ll extend those burns and we’ll start climbing into space,” Whitehorn told SPACE.com. “I think we can pretty safely say now that we’ll be in space in 2011. I would imagine they will continue to characterize the airframe through a few more glide tests. From there I would imagine it will be on tests of the feathering system. With feathering testing complete I’d expect powered test flights to begin.